Please use this thread for any news or discussion about any urban developments or projects proposed or going up in Atlanta's Midtown District. That is absolutely amazing!! The design is truly spectacular! The Mandarin Oriental looks great. I love the design and the way it lights up. Has there been any new on when they might get started??? BTW, great job IC on the updated threads!!! Trump has updated their website for the Atlanta project. 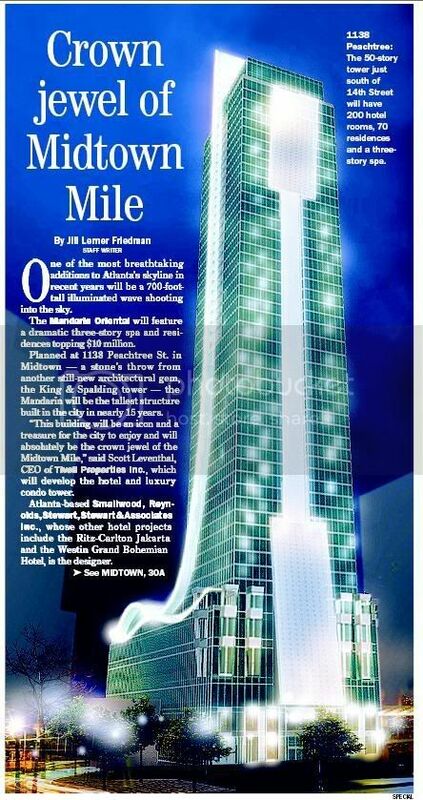 The people in Oakwood tower are about to completely lose their Midtown/Downtown view with the placement of Trump. Still not quite sure what I think about the design. According to the report, in early '08. Other than the curvature of the building, there's really not much interesting about the design. Btw, according to Business Chronicle there's a strong possibility that the winner of this seasons "Apprentice" will be assigned to this project. VERY nice addition to the skyline! That truly is a beauty for Atlanta! I'm not really a fan of the Trump design, they could've IMO put more thought into it. Also, will it really be that short as displayed in Trump's flyover on his site? The man made famous for firing people may be changing his name in Metro Atlanta. The Donald will begin construction for his new Midtown Atlanta condos next month. As the article notes, and some of you probably know this already, the building will cost $300 million to build. Prices for the 563 condos will run from $400,000 to 1.3 million (that's some high class livin' ). It is expected to be completed in 2009. I look forward to seeing it go up. I have become gradually less and less impressed by the Trump branded, Woods project. It could easily be a landmark complex, but instead will be lost eventually in Midtown. Hopefully within the next 5-10 years Trump will do something himself and produce something at least the caliber of the Mandarin. The only thing that stands out with the Trump Tower is the Trump name itself. It looks like just any other football. Edit: Did I really say football? I meant tower. Mandarin better not have a glass wall facing Crescent. There better be something good there. Hopefully the "Blueprint" handles what they can do with this side of the building. I'm sure if they had their way, it would be the entrance to the garage, but I don't think Crescent can be used as an alley-way. Novare had this same issue with the original ViewPoint plans which had the only entrance to the garage on Juniper. Is the Mandarin Orential a mid-block building? That video appears to shows what we've been hoping happens along the Midtown mile which is that the developers will allow the individual retailers to design the look of the individual spaces. This is one thing Atlantic Station got right and it would make the streetscape a lot more interesting. The #1 thing they need to do with 999 Peachtree is figure out a way to let people know you can park in the building. When the Grape was in that space you could park for free, at least for a couple of hours, and nobody I talked to knew about it. They always complained about parking. I've heard that Urban Outfitters was interested in a space at Viewpoint but I wonder if this video or some rendering may be the source of that rumour. 1231 W. Peachtree St-A developer is planning a hotel at this site across W. Peachtree street from the Trump towers. It's rumored to be a 20-story Hilton. Luxe has installed its crane. There's also a new rendering of the project. Onyx is on hold due to permit issues. Hotel Palomar is still excavating the site. The Woodruff Arts Center is taking steps toward possibly moving the new Symphony Center to a new site: over the MARTA station directly behind the arts center.